Happy Friday! I don't know about you but I'm so happy it's Friday. Got a little overwhelmed with things this week, so, I'm ready for the weekend. I'm finally ready to list the medium walnut bread boards that so many of you have been requesting. I happen to love this size and I have 6 available this week, but will have more. When I first listed these bread boards back in August, they had a "3" on the front. I decided to do one with a single initial to see what that looked like and I'm super happy with it. Of course, you can choose to do any single letter or number you like, just list your specific request in the note from buyer section when you place your order. I had fun playing around with these photos, though, I'm certainly no expert, it's just something I enjoy doing. I hope you all have a fantastic weekend! Click here to order my medium walnut bread board. Many thanks to you all! Hey there! I've got a special guest post for you today by the creative folks over at Arcadian Lighting. 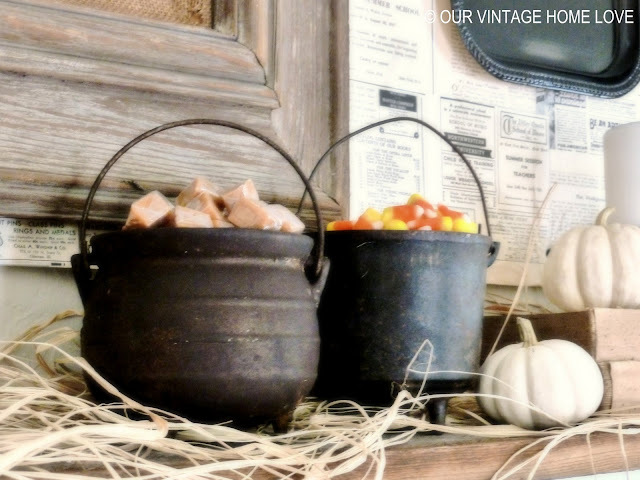 They have offered up a fall decorating inspired post guaranteed to get your creative juices flowing. Welcome Susi, a writer for Arcadian Lighting, one of the top online retailers for home light fixtures and lamps. Check out their website and cool blog for more information. Shorter days and cooler nights herald the fall season. Mums and pumpkins are appearing at the farmers' markets. Now is the time to shift our decorating from summer to fall and the cooler months of winter. 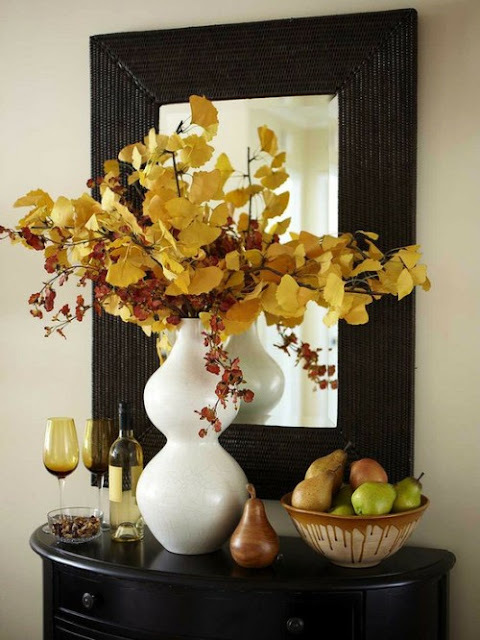 Nature is a great inspiration for fall decorating. 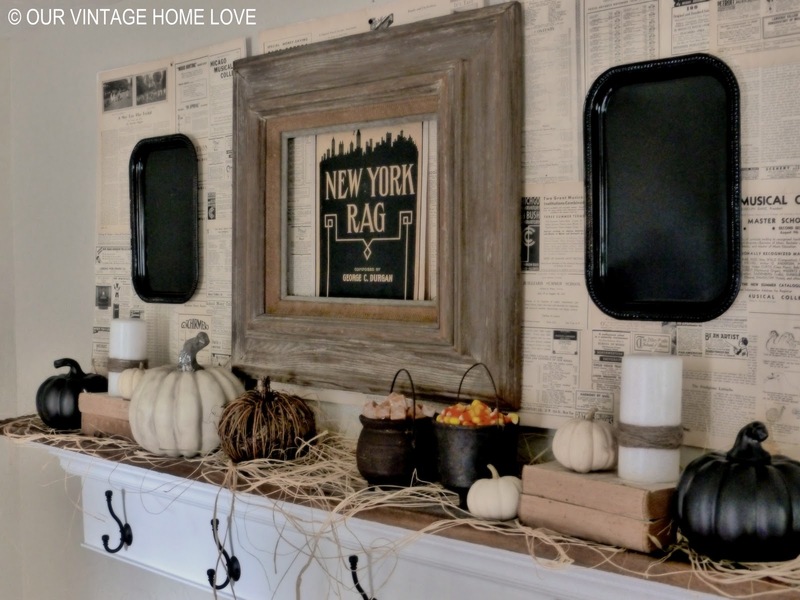 We've pulled together eight of our favorite fall decorating inspirations for you. Enjoy! Bold hues of fall paired with black make for a dramatic color palette. Swapping out white accessories for black or painting a mirror frame black will drastically change the feeling of the space. Not only can leaves inspire the colors of our fall decorating, they can become part of it in so many ways. 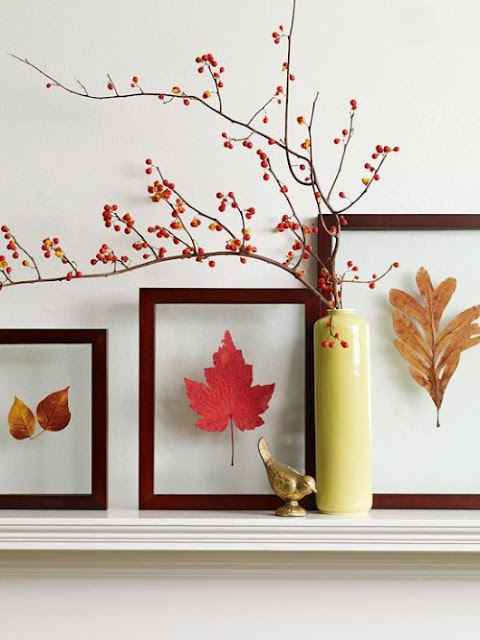 Framed fall leaves make colorful art for your walls or mantel. Seasonal decorating does not need to be bold to be beautiful, as this stylish bedroom shows. Eclectic furnishings and lighting fixtures are already in place. How easy to add fall color in subtle touches—pillow shams, soft blanket and delicate branches in a stunning glass container? Soft metallics lit by candlelight are beautiful for fall. Shimmering rose golds, mercury glass, golds, silver and bronze are all perfect for accents against the colors of all foliage. 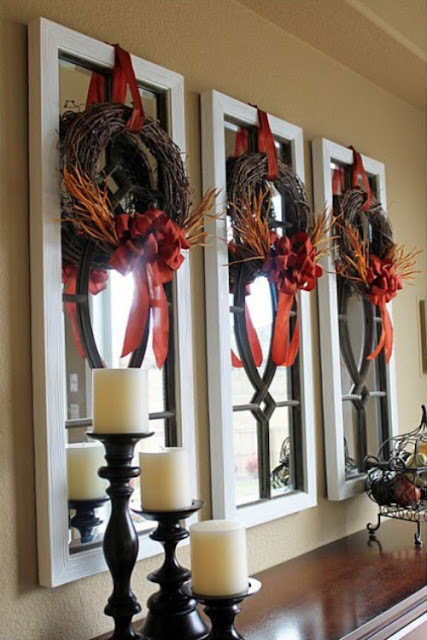 Inexpensive decorative touches like ribbons, leaves, wreathes and candles can add a touch of fall décor to any room. 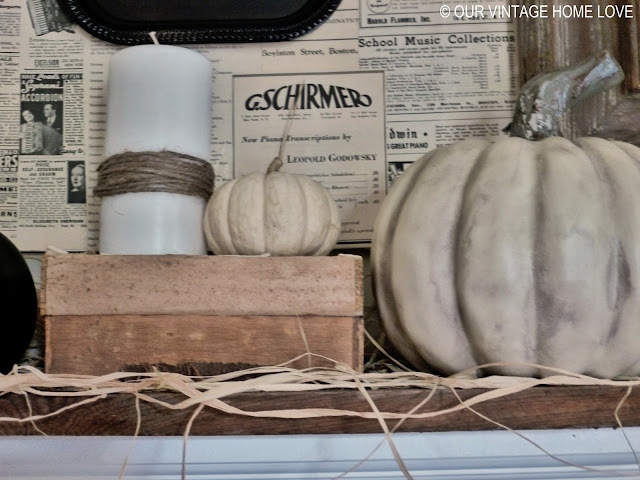 Branches from your yard and autumn squash are other inexpensive fall decorative touches. Take inspiration from Halloween and be creative. A jar of candy corn inspires a colorful runner that transforms the dining table into a seasonal star. 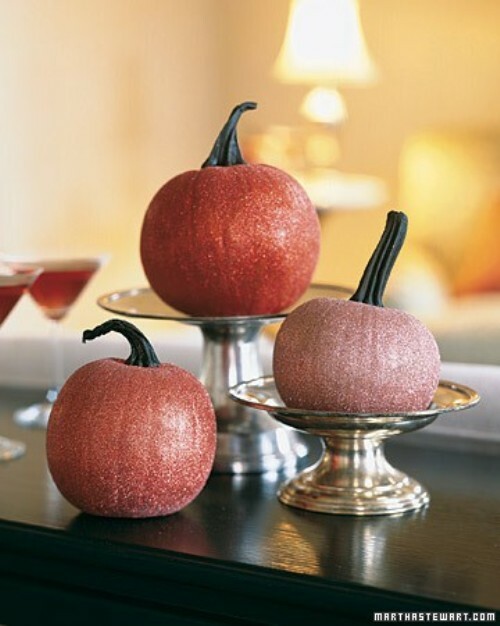 Of course fall décor does not have to be all reds, oranges, plums and browns. Pale wheat, silvery gray and white colors mixed with natural fibers and textures make for a beautiful autumn palette. 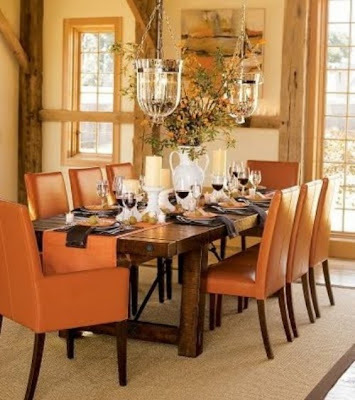 This rustic dining room with contemporary orange leather chairs is the perfect space for entertaining. Simply add a fall-inspired tablescape beneath the stunning bell jar hanging lanterns and you have an effortless change of seasons. Content provided by Arcadian Lighting, a site that specializes in top quality lighting fixtures at extremely affordable prices. 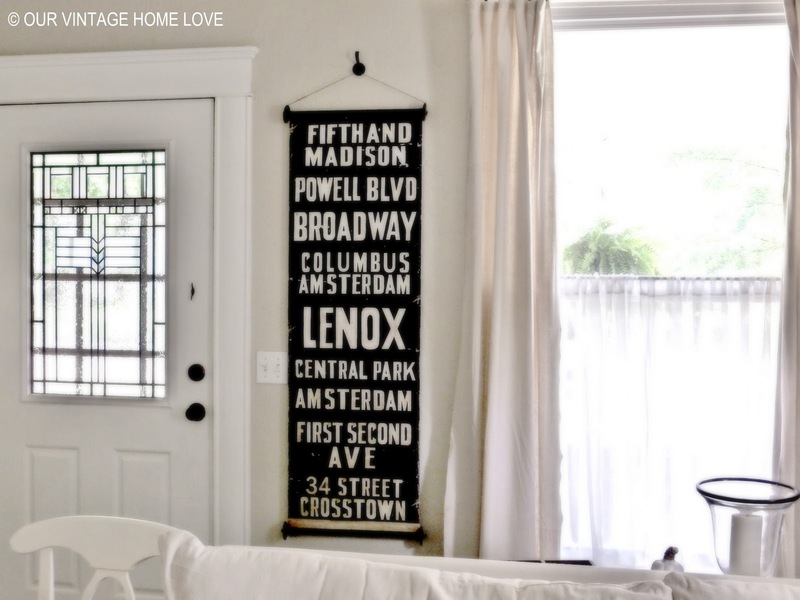 If you like this post, be sure to stop by the Arcadian Lighting blog and say hello! Thank you, Susi for putting together such a lovely post! I know that I'm going to be trying out several of those ideas. How 'bout you? Hey there! It's only the beginning of the week and I'm exhausted already and wishing for Friday. Can you believe we are nearing the beginning of October? I can't! It will be Christmas before you know it. Remember those vintage music magazines from 1936 and 37? Well, I didn't use them in the guest bathroom. I decided to use them here but I didn't want to commit to actually sticking them to the wall, so I picked up 3 foam boards from the Dollar Tree and glued interesting ads from the magazines to each one, then nailed the boards to the wall. The trays are also from the Dollar Tree, but I spray painted them oil rubbed bronze cause it's what I had. The pumpkins were decor I had left over from last year, except the small white ones, which are real. The old wood frame is one of the finds from our picking trip. I love the the music ad centered in the frame. I thought it tied in very nicely with the New York subway art also hanging in the room. These iron pots were also found on our picking trip. 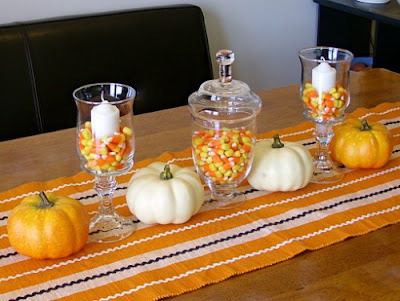 My kids love candy corn and caramel so I filled 'em up so they could grab a treat when they walk by. Happy Fall! Have a great day! Linking up with TLC! 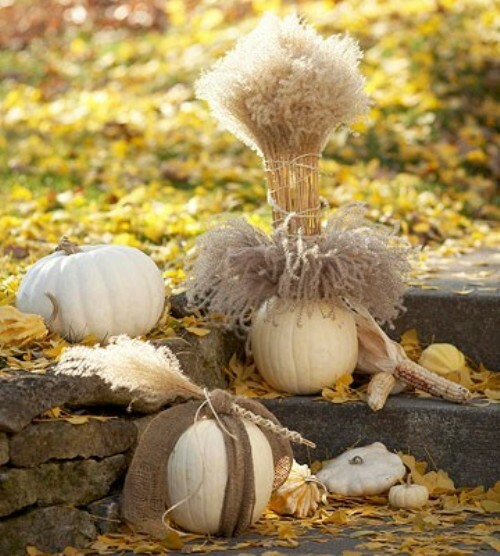 Come join the fun and get some great ideas for fall! We started with this gigantic section of salvaged bowling alley flooring that hubby picked up on one of his trips. That sucker is 3 inches thick and the only thing we had to cut something that large and thick was a chain saw! And I'm leaving the chain saw using to my man, so, he cut it for me. But we got it cut and surprisingly, the chain saw didn't leave the edges very rough and we were both still in one piece when we were finished. To complete the table top, I took my palm sander and completely sanded the top smooth. After that, I applied about 4 coats of glossy polyurethane. I then reattached the pieces of trim that were attached to the flooring section originally. The bottom of the table is an iron base we found on a picking trip. I cleaned it, sanded the rust off and spray painted it with Rustoleum oil rubbed bronze spray paint and then attached the top with large screws drilled through the iron into the wood. We were lucky that there were already holes in the iron base for this. I love all the imperfections in the top combined with the industrial looking base. We are so proud of this table! Of course, now I need to find a new place for the ottoman I recently built for this room, but that's okay. I just had to make this and put it in here cause hubby was so proud of himself for finding that section of salvaged flooring. It's something that we have always wanted to find. 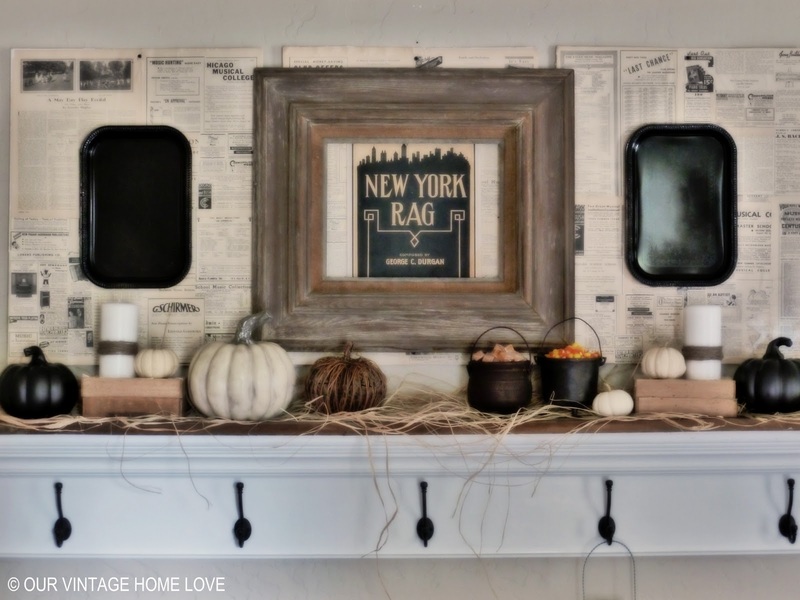 Tomorrow I'll be revealing our fall mantel/ledge, also in this room! After changing it up about a thousand times. Anyone else do that? We have found the best walnut supplier and I'm just absolutely thrilled. There are more of my other bread boards listed now. Click here to order! And check back tomorrow for the medium walnut bread board. Many thanks to you all! Howdy! I've had so many requests to make and sell the walnut mini bread board set I recently featured in my giveaway, that I've decided to start selling the set in my Etsy Shop! I'm so excited about this because these are walnut and you know how much I LOVE walnut. I just can't thank you all enough for the wonderful comments you left about this bread board set, as well as, my others. Happy Hump Day! It is Wednesday, right? What a week! Sure feels like it should be Friday! I've been working on our fall porch decor and one of the things I wanted to include was this gorgeous wood oversized row of hooks. It's called the Statement Row of Hooks and I just love it, but I didn't love the price, so I set out to make my own. Here's what you need. I picked up a 1 x 6 x 4 at Lowe's along with 4 table legs and some 2 1/2 inch wood screws. Since the 1 x 6 was already 4 feet long, I didn't have to cut it to length. For the hooks, which are quite large as the name implies, I chose to use table legs that I cut off to be 8 inches long. Next, I placed them exactly where I wanted them on the 1 x 6 and traced a circle around each one. My "pegs" were 6 inches from the end with approximately 10 - 11 inch spacing between each one. This is the back side of the row of hooks. Next I pre drilled a hole into the center of each circle. And then pre drilled a hole into the center of each of the cut table legs. Then drill your screw into the pre drilled hole in the circle until it begins to come out the other side of the board. Line it up with the hole in the table leg and while holding the leg tightly against the board, continue drilling the screw into the table leg. It should be very tight. It's important to use 2 1/2 inch screws here because they make the pegs very sturdy and able to withstand holding something fairly heavy. I'm super happy with it! I've got some special things to hang from it for fall, as well as, some other fun things in store for the front porch but I wanted to show you what it would look like first and show you how you could make your own. 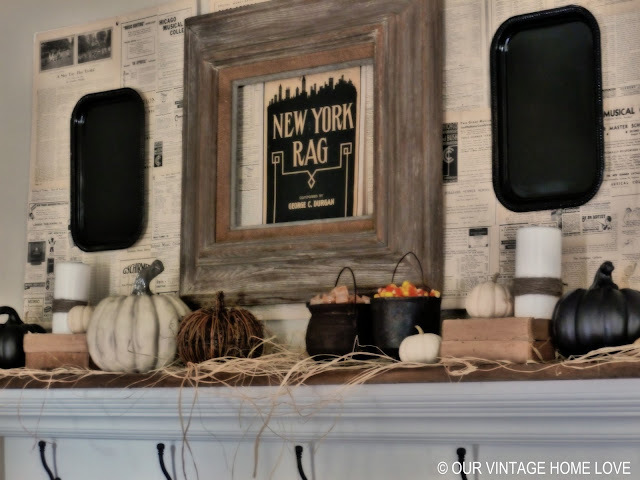 I really wanted to add some warmth to the porch for the fall season and make a statement so what better way to do that than to add a statement row of hooks, right?! Total cost for this project was just under $25 for the pine 1 x 6 x 4, the 4 table legs and the package of screws. The stain and foam brush I already had. Can't beat that! I just love it! Stay tuned for the complete Fall porch makeover very soon! Have a great day! Happy Monday everyone! This weekend I got to go with my hubby on my first picking trip. In a word, ick. Now I know why he, and his clothes, come home filthy from these trips. The place we visited was an old garage/shed that was filled with junk. Here are some pics I took of what we were pickin' through. Yup, a bunch of junk. But, oooohhhhh, did we find some great stuff and it was all free. There were so many piles of stuff that we he had to sift through and it was also raining. And gross. After all that, here's the loot I picked. It still all needs to be cleaned up, but I actually like that part. We found lots of old solid wood frames that look like they were made from barn wood. Those will be fun to do something with. And some old wooden crates and a caddy. I never get tired of those. Some cast iron and vintage kitchen utensils for my collection. Lots of red enamelware, vintage wine and milk bottles and a vintage Christmas tin. And one of my favorite things is this old metal tin. I love it! I think it will look so cute with fresh flowers in it. One of my other favorites is this old kitchen stool. Love this, too, and I'm not planning on doing anything to it but clean it. I think it's perfect and I love the color. 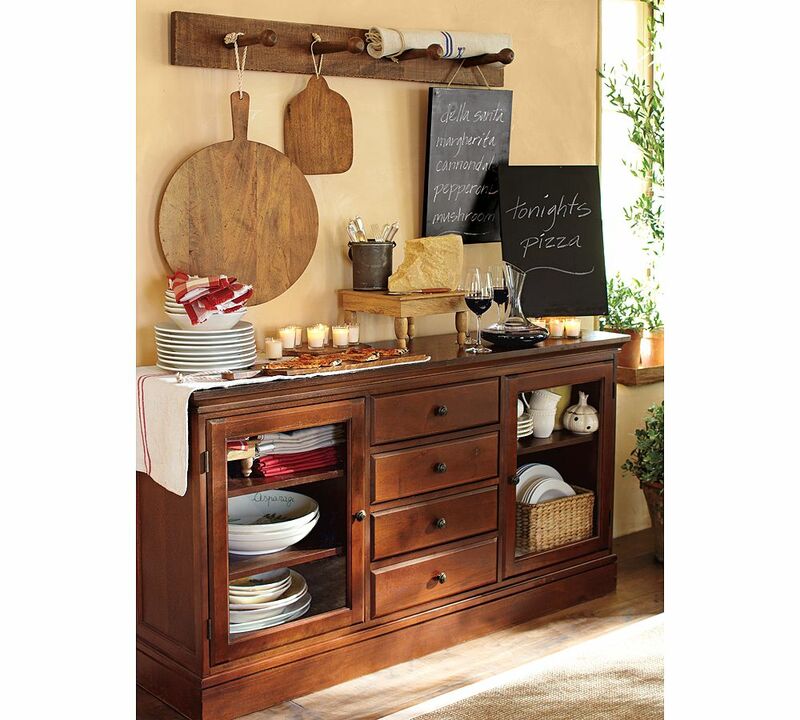 I can't wait to put it in our kitchen. And it will come in so handy because we have tall cabinets because of our very tall ceilings in the kitchen and I've been using a dining table chair to reach to the top cabinet, which has been a pain. This will work perfectly! This is our other pile of loot that hubby picked the day before. More frames, another caddy, kitchen utensils, a couple of vintage yard sticks and a very old metal Pepsi crate. I was thinking that metal Pepsi crate would be adorable with a couple of pots of herbs hanging out in there. I have fun plans for all these things after I give them all a good cleaning but I saved the best for last. A couple of weeks ago hubby found a couple of sections of salvaged bowling alley floor (something we've always wanted to find) and brought it home. I've always dreamed of making a unique table with salvaged bowling alley floor but had been struggling with what to use for the base. Until I found this today. It. Is. Perfect. I am super excited to get busy on that project! Here's a pic of the salvaged flooring. It needs to be refinished and cut but I'm excited about that, too! There is something magical about bringing wood back to it's original beauty! Stay tuned for that! I'd say we had a pretty successful day and I was thrilled he let me come along! It's Bread Board Monday in my Etsy Shop! My pre-order waiting list has grown tremendously so be aware that there will be at least a 2 - 3 week delivery time on these. :) Thank you! Have a great day!